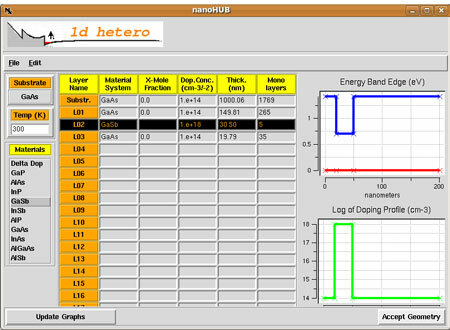 (Nanowerk News) A new version of 1dhetero, a tool able to simulate new technologically relevant III-V semiconductor materials at atomistic level, has been released at nanoHUB.org. The tool is still under development and, according to Sellier, a new release should be deployed very soon, able to simulate multibands, sp3s* and sp3d5s* tight binding models. Even if still under development, the tool is already very reliable and able to simulate real devices at atomistic scale.